Performance Cat Back Exhaust systems offers better flow with reduced back pressure for improved performance. These systems typically offer a lower deeper tone with a slight increase in sound volume. Some of these systems install at the front flange, the others are spliced in after the secondary catalytic converter or resonator. NOTE: Some states (like California) have ever tightening requirements for emissions testing and inspections. Always check your local regulations on compliance for street use. Here is a handy guide for identifying the exhaust system to fit your MINI Cooper. 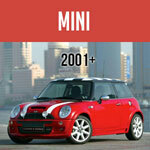 See our Mini Cooper Performance Parts, an Upgrade Guide for your Mini for other upgrade options. QuickSilver MINI Cooper Exhaust - Produces superior exhaust systems to increase performance & durability, improve appearance, enhance sound and reduce weight, saving up to 40 kgs against an OE equivalent. The Mini Cooper Exhaust system for either the regular MINI Cooper or the MINI Cooper "S" model is also often called a “Cat-Back” system. A Mini Cooper Cat-Back exhaust system basically replaces the stock exhaust. 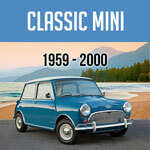 For the Mini Cooper exhaust there are a number of choices on the market from several manufacturers.